Ah, the glory of Shetlandic skip-diving! Who knows what you'll find? Alas, the shelves I thought were painted wood turned out to be chipboard, but still, I found room to dump two outgrown, rusted-solid bikes, and the redundant Swedish Mulltoa electric biological composting toilet. Of which more another time. 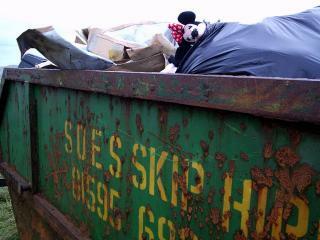 But what was Minnie doing there? I swear I didn't set this up. There she was, pleading for rescue. I left her there, of course. 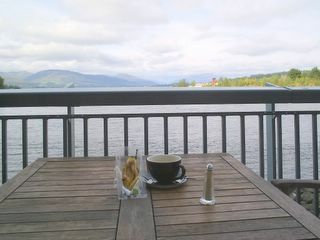 Arrival: A well-deserved break, having reached Loch Lomond on a Sunday jaunt from Glasgow aboard a slightly-too-small bike. 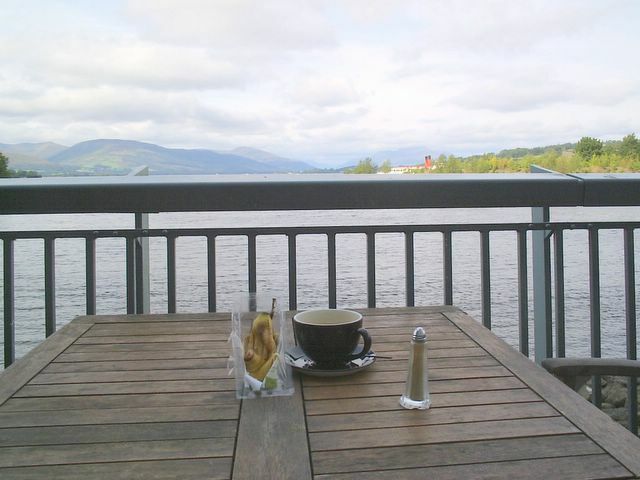 This is taken from the balcony at the Loch Lomond Shores centre, which is a pretty stupid name for a naggingly disappointing development. A Jenners store on the West of Scotland? Hmm...the steamer Maid of the Loch, still not fully restored, is visible right of centre. Ah, wondrous Bowling. So many fantastic memories from the days when it was a shabby, rundown repository for mouldering old boats, many of them sheltering long-term residents. It's slightly, but not entirely, gentrified these days. I used to be the only person, it seemed, who came here. Now? Well, now it's packed with picnickers. Still smells funny, though. 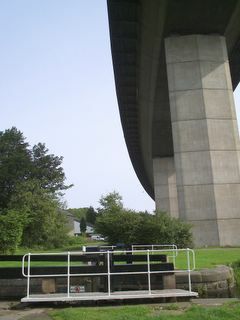 Locked: Under the Erskine Bridge, on the Forth and Clyde Canal towpath. 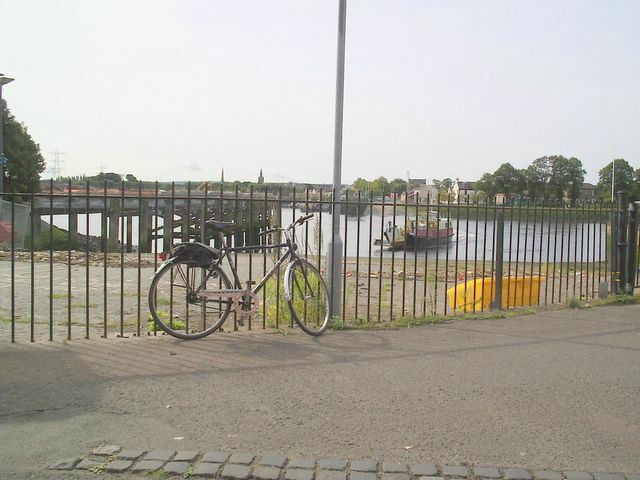 I half thought of cycling over the bridge (there is a cycle and pedestrian path) and then coming back to Glasgow via the Renfrew Ferry, but my ability to cope with heights is much diminished since I last did that run, some 21 years ago. So I went to Loch Lomond instead. 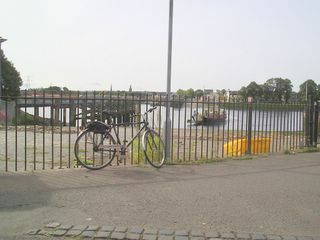 Whiteinch side, Renfrew Ferry, Sunday morning. I'm sipping instant coffee and eating nuts. This is the last of the many Clyde ferries that used, in the great industrial past, to shuttle workers back and forth. One of my favourite places in Greater Glasgow. If I hadn't been hungover and on a health kick, I might have left things until later and had a drink in the bars on each side of the river. As it was, I decided to kick out for Loch Lomond. The bike's a curiosity: Dutch, it still has an Amsterdam licence on it. Don't know if that means it's nicked, but it has strange Netherlandish aspects: a back-pedalling hub brake, seven-speed hub gears (fantastic) a stand and a dynamo. Weighs a ton, but for 40 quid, who's complaining? Great Schwalbe Marathon tyres. Takes towpaths in its stride. Apparently a direct transcript of something said by one of the survivors of the great 1927 Mississippi flood - reckoned as "the greatest natural disaster in the history of the USA". Until now. The 1927 flood did not bring the same level of catastrophe as the aftermath of Hurricane Katrina, but the parallels are very interesting. Refugee camps, mainly black. 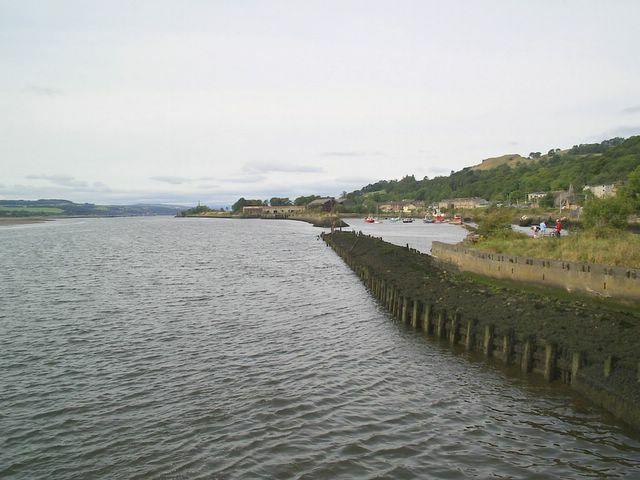 A lack of investment in flood prevention. There are the stories of governmental ineptitude and alleged corruption. And racism: It is possible to trace the development of the New Deal, the desertion by blacks of the Republican Party, the rise of Huey 'Kingfisher Long and the downfall of a president to the 1927 flood. All of this has remained little discussed in the media thus far, though there are signs that things are changing. This book is now in the American best seller charts, and Greg Palast has a powerful and brief summary of the potential effects on the Democrats. Although Todd Leopold of CNN has written movingly of the song and his own background. From the personal to the political, though: remember, history always repeats, as Steve Turner wrote. Has to. No-one listens. Get Newman's album Good Old Boys, by the way. It's a masterpiece.